When my plates were up for renewal I succumbed to the urge to get a customized plate. I know there is a stigma surrounding vanity plates, I generally eschew plates like “MeBallr” and “HotStuff”. I wanted to go with something related to this blog. 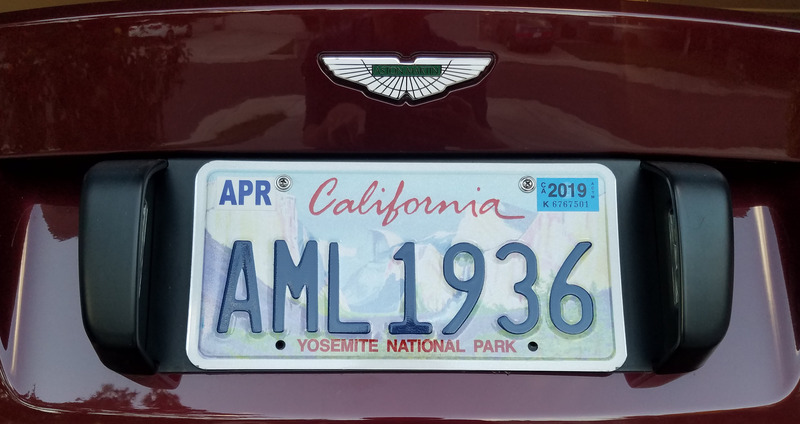 She’s now sporting her new California plate ‘AML 1936’ to go along with her heritage and this blog. It’s the short form of “Aston Martin Lagonda DB9 car number 1936”, and similar to this blogs name Aston1936. The plate is one of the California DMV optional Art plates (where the fees go to support the arts, which suits me fine). It is the Yosemite National Park plate. You’ll see it pop up from time to time now in new posts. Sorry, I had to put it online. It’s like baby pictures. I _needed_ to show someone. Vanity. Now back to writing about something more useful. Up next – how to inspect your sway bar/anti-roll bar bushings as the final article in the suspension work I did recently. I’m sure you all can’t wait. very cool plate and love the Yosemite background – its an awesome place.